Unwieldy and heavy as hell, we are pleased to announce that all antique machinery has been safely relocated. Luckily, no moving crew members were harmed either. The new dedicated production room features enhanced bindery, foil stamping, die cutting and complete print finishing capabilities for all your letterpress business and promotional materials. A separate studio area will be used for artistic printmaking, workshops and other fanciful whims. More information on studio events will follow soon. Right now we are focused on getting the production presses humming. Visitors are usually tolerated. Or, for those who only work from the comfort of their own swanky offices, job orders by phone or email are accepted for customers throughout the country. Call 800-433-1288 to discuss your job. What we had to lug. If you’ve ever seen letterpress printing equipment close-up you know it’s not built for portability. For starters, there are whole fonts of type that are actually cast in lead. Likewise, the spacing material that’s used between lines of hand-set type is appropriately named lead. Drawers full of wood type are a little easier on an old man when moving. But printer’s ornaments, borders and all the other odds and sods used in traditional printing are all a real pain in the back. Of course paper is lightweight if you are talking about one sheet. However, large cartons of the stuff is another story. Last but not least are the presses and other machines. It’s safe to say we gave the freight elevator a good beating on our way out of the old building. 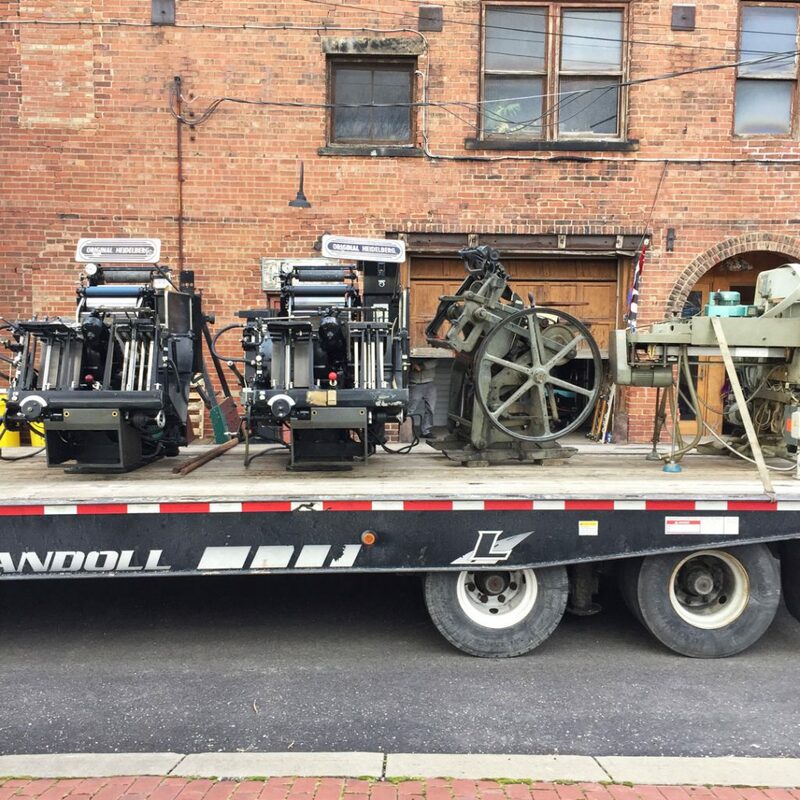 Several printing presses and a paper cutter loaded and ready to roll. A brief history of the print shop. 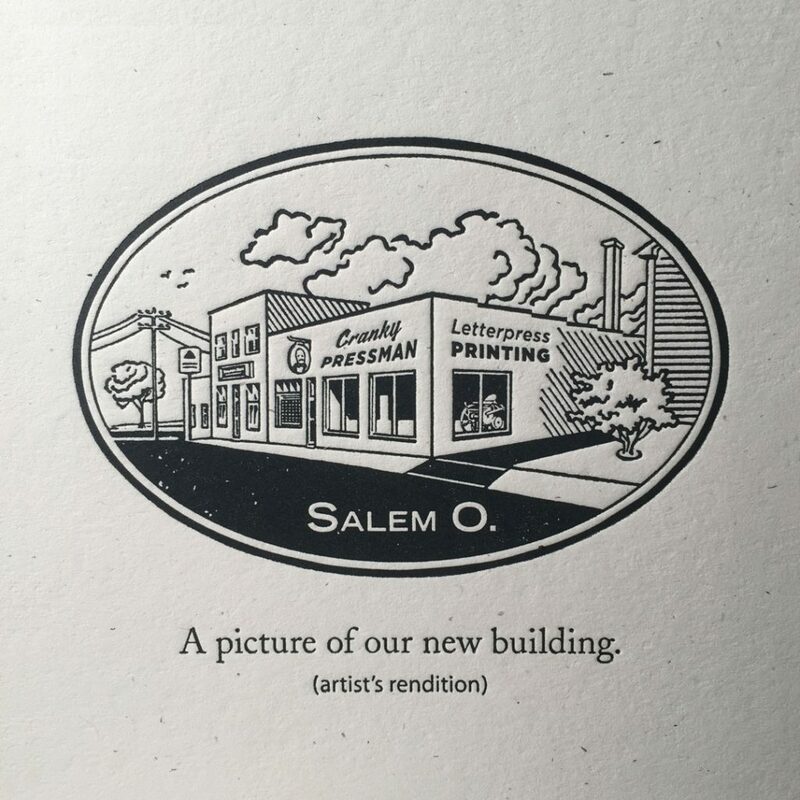 Originally founded in 1938, the printing shop has been in Salem, Ohio for a long time. Back then it was located on the ground floor. Then in the late 1950’s the second owner of had the bright idea to move tons of letterpress machines and printing equipment to the 2nd floor of a 19th Century building. Keith Berger took over the place in 1984 and has run the business from the upstairs space that was used to store hay when the building was a horse livery. At the turn of the millennium offset printing began to be phased out of the services. Cranky Pressman was born in 2003 (he looks a lot older than he is) and the shop has been all-letterpress since then. 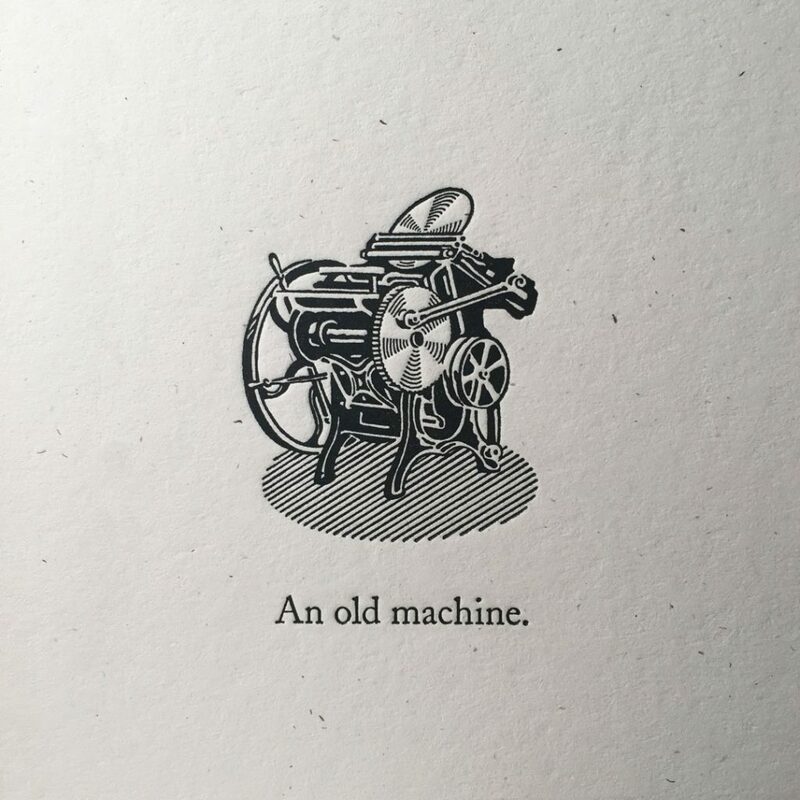 We do however have a trustworthy bunch of outside suppliers such as lithography printers to call upon when the project requires (such as combination litho and letterpress pieces). The new building will help us improve our letterpress offerings even further. Be assured, we have reinstalled our fussy customer service and finicky production skills to the new location. Basically, everything is set-up and run to help creative companies create attractive print materials. Honestly, the new place is maybe too clean and tidy right now. We would very much like your jobs to help bring back some of the inky patina we are accustomed to. Please give us a call at 330-337-3341 to discuss your project.